http://media.sas.upenn.edu/pennsound/authors/Auster/Auster-Paul_03_1st-2-pgs-Bk-of-Illusions_UPenn_4-11-01.mp3The complete UPenn event, including introduction and a lengthy reading from the second chapter is available here. 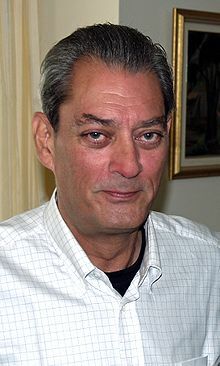 Penn Sound, which hosts the above reading, also has audio of Auster reading the entirely of an early collection of stories, The Red Notebook: True Stories, at the University of Buffalo in April of 1995. Auster has argued that fiction is “magnificently useless,” but valuable nonetheless for the joy it brings both writers and readers. In The Red Notebook he narrates what he claims are true events from his life. The collection is divided into four short sections: “The Red Notebook,” “It Don’t Mean a Thing,” “Accident Report,” and, the final narrative, “Why Write?” His answers to this final question--whether they're really “true” or just magnificently useless inventions--show us surprising coincidences and odd patterns in the seemingly random business of daily life. Listen to the first installment below. You can find the complete audio, with introduction by Robert Creeley, here. Penn Sound is a “center for programs in contemporary writing” at the University of Pennsylvania and features a large archive of recorded audio and video readings and discussions on contemporary poetry, fiction, and more. The reading of The Red Notebook appears in our collection of Free Audio Books.